In my current job as a proofreader of educational testing materials, I am often called upon to check the spelling and grammar of math problems that I have no idea how to solve. This is OK; there are other people in the company to check the math. It’s kind of like I work on an assembly line, checking that a particular bolt has been correctly screwed into each of an unending supply of identical gadgets that have a use I do not understand. I mention this because I found myself this morning trying for a moment to figure out how many different looks the Pittsburgh Pirates could display in the late 1970s using their three different mix and match uniforms. Before I could come up with an answer I discovered that they added a fourth uniform to their arsenal in 1980, and also had two different types of caps and two different types of socks. In all, during the short window of time in the late 1970s and early 1980s in which I based a large part of my existence upon the shifting sands of major league baseball, the Pirates had a gold uniform, a black uniform, a pin-striped uniform, and (starting in 1980) a white uniform, and they mixed and matched all of these either randomly or according to a plan which is no clearer to me than the tortuous runes of advanced calculus. 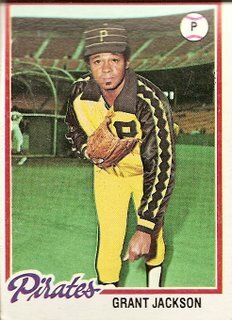 With all the possible collisions of black, gold, and pinstripe, no single card can convey the full impact of the collective ugliness of the Pirates during the coke-addled death throes of the Me decade, but this Grant Jackson card, which shows that a nauseating warm-up jacket was also part of the Pirate wardrobe, can at least suggest something of the impact of that ugliness on the players forced to withstand it. In other words, Grant Jackson does not look that happy. But, typical of the Pirates of that era, Grant Jackson even more strongly presents the aura of a true professional, resigned to carry on to the best of his abilities even though he’s dressed up like an overripe, blackened-at-the-edges banana. He has already been in the majors for over a decade by the time of this photo, and part of his resignation may be due to the fact that for most of that time his career has afforded one Dale Murray moment after another, i.e., he’s always seemed to either arrive on a team just after they’ve had success or depart just before they’ve had success. His first stop was in Philadelphia just after they nearly won a pennant in 1964. Hopes must have been high that they could continue rising toward the top the following year, but that didn’t happen, and in fact throughout Grant Jackson’s time with the Phillies they gradually sunk farther and farther away from first place. Later just-misses included his move to Baltimore the year after they’d won the 1970 World Series and his move away from the Yankees just before they won the 1977 World Series. His arrival on the Pirates seemed to have the potential to provide more of the same, as they seemed to have just fallen out of a groove that had garnered them 5 division titles in 6 years. But Grant Jackson was a pro, and he kept showing up for work in whatever atrocious combination of polyester shirt and pants was called for that day. His persistence paid off: On October 17, 1979, Grant Jackson (clad in the combination of the day, gold shirt and black pants) was called into the game with two on and two out in the fifth inning of the seventh game of the World Series. The Pirates, who had battled back from a 3 games to 1 deficit to tie the series, were down 1 to 0 in the game and were having trouble getting anything going against Orioles starter Scott McGregor. They could not afford to fall farther behind. Grant Jackson did his job. He held them, getting Al Bumbry to pop up. In the sixth inning Willie Stargell menschishly swatted a two-run homer to give the Pirates the lead. Grant Jackson held the lead while facing the heart of the Orioles order. He pitched 2 2/3 innings of scoreless ball in all before giving way to bespectacled Pirates relief ace Kent Tekulve. When Tekulve got the final out, Grant Jackson officially became not only a champion but also the winning pitcher of game seven of the World Series. Josh, you weren’t kidding about Jackson’s uni in the Stargell thread. BTW, I enjoyed the All-Star post. PS – I took A Fan’s Notes out of the library. As with most books lately, I started it but didn’t get too far. I’ll have to hit the library up again a little later when I have more time. A Fan’s Notes! Love that book. -The Universal Baseball Association, Inc., J. Henry Waugh, Prop. Joshua…what is this “base ball” of which you speak? You reference the late ’70s. The early ’80s. But nary a word on Bobby Knight? Or Magic and Michigan State? Or Bird’s valiant Sycamores? And what is this “World Series?” you embellish? If I want to see Cardinals battle Tigers I shall tune into the Sweet 16 and watch Pitino and Louisville tackle Memphis and Calipari, thank you. Is it not March, sir? I’d like to hear more about this “Basketball Kid”, Pete.